Hello folks, hope you’re all well. It’s been a really hectic fortnight or so and the weather’s certainly made it a bit wild at times! 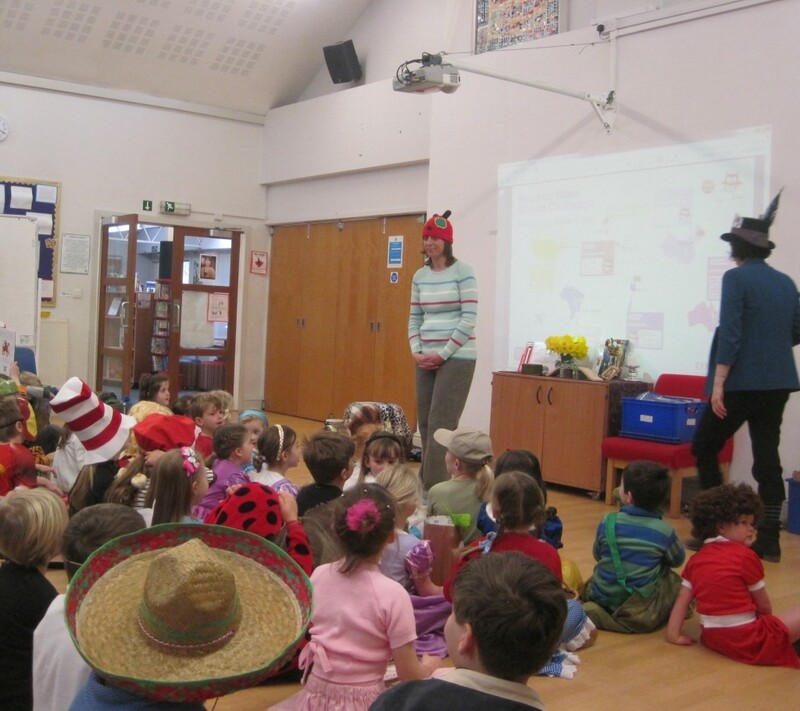 Last week’s highlight was World Book Day which was great fun – hopefully we will have some photos on the website soon. This week has been assessment week in school so, in addition to looking at work in their books, the teachers have been giving children some specific tasks to help make judgements about how pupils are doing in English and Maths. The Year 6s have had a mock SATs week to familiarise them with what the real thing will be like in May. All these assessments will be shared with you during parent consultations on Weds 27th/Thurs 28th March. Other things that have happened: On Tuesday Mr Prescott, the rector, visited for his fortnightly worship while on Thursday evening the Governors took part in some stimulating training about pupil health and well- being and its link to attainment. The school choir took part in the Southampton Festival of Music and Drama and sang beautifully. We didn’t win this year, but acquitted ourselves extremely well, gaining a distinction from the adjudicator. We were the smallest choir there and I’m pretty sure the only one with children from KS1 so it was a great achievement for them. Big thanks to Mrs Allen who has been coming in to help with rehearsals; hopefully we’ll be able to give everyone a rendition at a celebration assembly soon! Finally, we’ve been notified that we have our church inspection next Friday 22nd March. If you’re interested in chatting to the inspector about your experience, and that of your child, of being at Compton as a Church of England school, please let the office know. The inspector (Mrs Sally Jenkins) is keen to chat to six to eight parents at 3.10pm on the 22nd. We’ll also be having a visit from Chris Lloyd on that day too. He’s one of the trustees from Education Uganda and has recently returned from a visit to Katiri Primary School. He’ll be visiting all the classes during the day, sharing photos and more information about the latrine project that we’ve started. I look forward to seeing you all next week – have a super weekend! Hello everyone, I hope you are all well and not stricken with the nasty bugs that seem to be circulating. From what I hear from other headteachers, we have been quite fortunate so far, and we are pushing the ‘personal hygiene’ message quite strongly at school to try and keep it that way! Over the last couple of weeks the children have become really immersed in their topic work in each class and I was excited to receive a special invitation to attend Foxes’ ‘Anglo Saxon Day’ this Friday coming. I’m not too sure about the dressing up bit though….. The big excitement for Falcons class last week was Bikeability training, which took place Monday to Thursday via two x two-hour sessions each day. This year there was enough funding for both year groups to take part and it was enjoyed by all, even those who were very nervous to start with. It’s such an important skill to learn so we were delighted the money was there for everyone to improve their proficiency and road sense. Ladybirds children have been making things related to the book ‘Peepo’ which was published in 1981 and so is now used as historical reference material. This made me and Mrs Cook feel very old! The children are using a ‘plan, do, review’ approach at the making table to try and improve their overall designing and making skills. We watched some children from Hedgehogs class perform their own poem at Celebration assembly on Friday. The children have loved watching videos of Michael Rosen performing some of his poems based on playing. They have observed him carefully, noting all the vocal and facial expressions he uses and are trying to incorporate this into their own work. Great fun! I hope you stay bug-free over the half term break and have a lovely time with friends and family. Hello everyone, I hope you have all had a great week. Welcome to my new fortnightly blog which will replace newsletters from now on. We’ve had a really positive start to the new term and the New Year. The children are bright and seem well-rested after the holidays – having those extra few days after 1st Jan seems to have done everyone good. Monday is Martin Luther King day and during the week all classes will discuss his life and how his values and vision for civil rights in America still inspires us today. Ladybirds will be starting the Katie Morag topic, which is already extremely popular in Hedgehogs class – see comments below. Hedgehogs class will be investigating food chains in Science. Foxes class will be investigating magnets as well as discussing famous speeches and writing their own. Falcons class will begin their RE topic: Hinduism, and will also be learning more about how to write newspaper reports. See some of our children Flossing 4 Funding on the playground this morning! Thank you to everyone who sent in a shoebox for the Rotary Christmas appeal. They were collected this morning. On Thursday 6th of March it was World Book Day when we all celebrate the wonderful world of books. Here at Compton we had an exciting, and adventurous time dressing up as either a character from a book or a country from around the world. It was an eventful day involving traditional storytelling from Africa, an extraordinary and stimulating bumper book quiz and the around the world reading book challenge raising money for Railway Primary School. Firstly, we all went into a special assembly where we all showed each other our costumes. 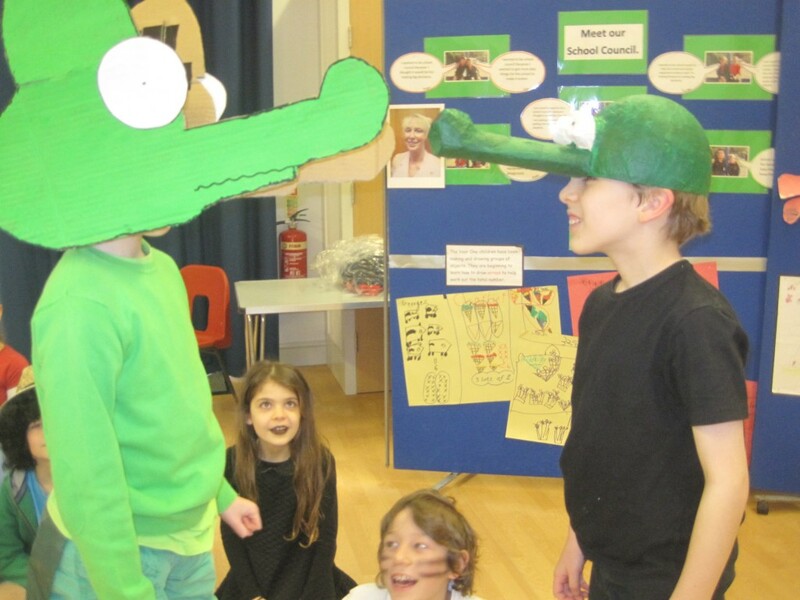 Some funny ones were two pupils dressed as crocs; one was called Bob and the other Larry and also one other pupil was Charlie Cook and his brother came as his favourite book. Secondly, there was a quiz matching books and teachers. We had to find out which teacher read what book. Who knew Mrs O`Shea`s favourite thing to read is the Saints Annual? Next, we had storytelling from Mrs O`Shea who told us a story from Africa called “Awongalema” it was about a magical tree that could grow fruit if you said the magic word. Lots of children helped tell the Story and afterwards we talked about the moral and what you learn from the story. After lunch, it was time for the Bumper Book Quiz! There were lots of teams from each year. We all worked together to get the answers to questions about books. Team D won the quiz with 77 points. Well done to them! World Book Day is over for 2016 but we still need to raise money for Railway Primary School – helping to fund books for their library – so please remember to keep reading and bring in your sponsor money! 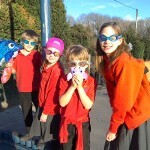 Get your goggles on Foxes Class! 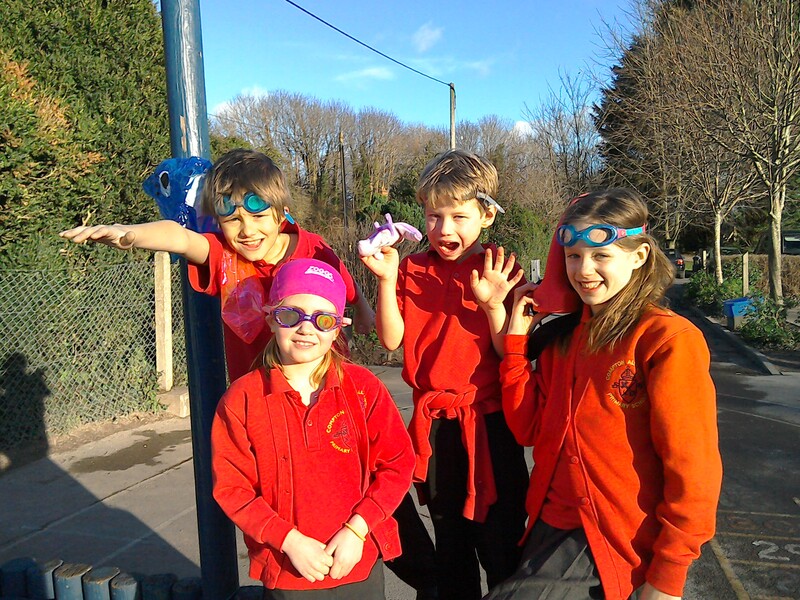 Read our article to find out some of the finest facts about Foxes’ class swimming. 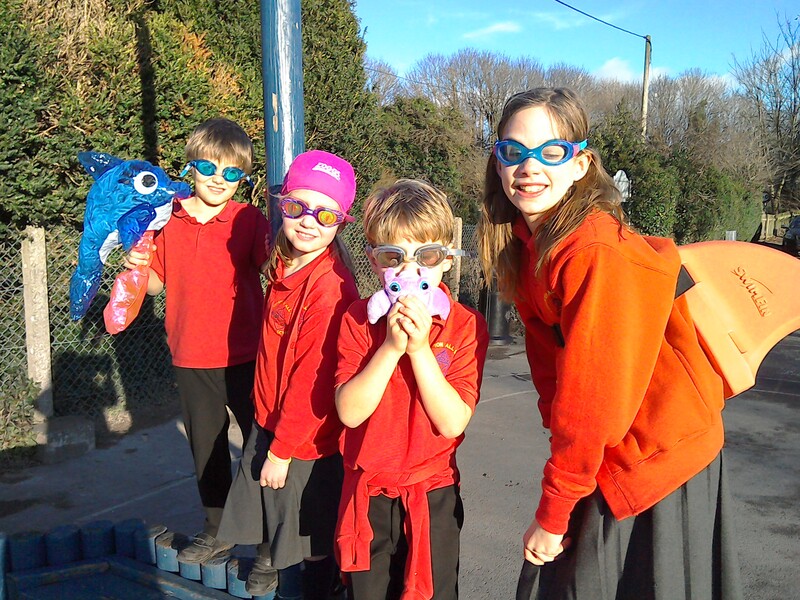 We had a chat with four pupils from Foxes class when we asked them all about swimming and how they feel about it. Question: How do you get to swimming and where is it? M: We go to Fleming Park and we get there by coach. Question: How is it organised at the pool, and what groups are there? Al: There is 1 big pool and 1 small pool and there’s different groups in the different pools. If they see you doing well in the small pool they’ll move you into the big pool and if you are still learning you will stay in the small pool. L: The lesson lasts for 30 minutes. A: There are 3 different groups. There is: stingrays, dolphins and sharks. Each one of us is in a different group. Stingrays are in the small pool, sharks and dolphins are in the big pool with sharks in the deep end. Question: What do they teach you? M: This week they tested us on different types of swimming. We did all kinds of different strokes including front crawl, breast stroke and backstroke. We also did treading water. Sometimes we have to do demonstrations to show the others what to do. Question: What is it like when you first get in the pool? M: It is quite cold but I get used to it quickly. Al: I just kind of slipped in (laughing). L: It felt nervewracking but we were in the little pool so we were able to stand up. I was nervous because there was a good swimmer who stayed in the small pool and I thought I would stay in the small pool too. Question: What do you like about swimming with your class? M: I like doing it with my friends. A: I like the fact that I can help other people. Al: I like to complement people on their swimming, how well they are doing. L: All of my friends keep me company and that helps to keep me going. At Fleming Park you have to wear hats and I like that because I get worried about my sister getting nits because she doesn’t wear a hat when we go to River Park. Question: What do you dislike about swimming with your class? Al: When people are splashing around and I can’t hear the teacher and we have to do the lesson and I just don’t know what to do next. A: I think it is a bit too easy compared to my swimming and I think they make up their minds too quickly about which groups we should go in. L: I don’t like it when I get tired and I get scared that I’m going to stop and they are going to say “well, she’s not very good“. I also don’t really like the fact that there are 33 of us split into 3 groups and its too crowded in the pool. Sometimes we have to swim one at a time in our lane because otherwise we might collide. Question: If you could change something about swimming, what would it be? Al: I think there should be a few more groups, and also more changing rooms. M: Because there was something like 5 or 6 people in each changing room. All the girls were in one changing room together. Question: Have you had swimming lessons before? Al: Yes I normally go to different pools with my uncle. I’ve been before with my old school too and last time I went with them we went to Fleming Park too. A: I go to Fleming Park but when I go there’s 9 groups and it took me 3 years to get from the first group to the fifth group. At my lessons you have to do lots of different things to move up a group. M: I go to Winchester College and they move you up quite slowly as well. A: At my swimming we have an online system where they mark you out of more practice, not bad, good and brilliant and once you get all of them ticked off you can move up a level. L: I go to River Park which we were going to go to with school but they decided to go to Fleming Park instead. When we go with school it’s very crowded with all your class mates by your side. Question: Do the teachers push you? Al: Yes. When we first got in the pool they just told us to swim straight across and they didn’t show you what to do. They just assumed that we already knew how to do front crawl. A: Some Year 3s didn’t know what to do but they do follow you with a woggle in case you get stuck. M: In Sharks, it is quite hard because they made you do 2 lengths front crawl and then get out and then immediately do 2 lengths backstroke which made you feel really tired. Thanks to all the children who took part in this interview. I met with Ms Driver to find out about her school life here at Compton and when she was a pupil herself. Find out about her childhood passion for spies and spying and lots more besides in my article below. What was your favourite subject when you were at Primary School? English – I really loved stories, I really loved poems, I really loved hearing and writing them. I always had my head in a book. Was your Primary School the same or different to Compton? I went to two. One in Bath which was a really big city Primary School and I had a really nice teacher called Mrs Wilson. When I was starting Year 6 I moved to Devon and went to a little school with only 60 children in total. It was a really big change from what I was used to but I had an amazing teacher (Mr Watts) who was an artist so we got to use lots of different things like watercolours and lino printing. It was absolutely the best year of schooling I ever had. Did you always want to be a headteacher and if not what other careers did you consider? When I was very little I wanted to be a nurse. Then I spent quite a long time wanting to be a spy. I used to follow people around with a notebook and hide in trees because I had read a particular book. After that I wanted to be a journalist. It was always something to do with writing. How long did it take you from when you started teaching to where you are now? It probably took between 15-17 years from when I started my training course to now. When you were starting out as a teacher did you ever think you would come this far? No. I had no interest in becoming a Headteacher at all. I just really wanted to be a teacher. I just loved being in the classroom. What do you miss the most about not teaching every day? I very much miss having the relationships with the children in my class because you really get to know everybody. I also loved the feeling of being in a team and planning exciting things to do as a class. I enjoy the relationships with everybody (children, parents, staff and governors), talking to them and seeing how everyone gets on. I like seeing the children and the adults interacting. I like getting things done that make a difference. Interference from the government every 5 minutes really gets on my nerves especially from people who have never really been in the classroom. Also I really don’t like the excessive paperwork. Can you describe your job in 3 words? That’s a really difficult question. I would say rewarding, tiring, stimulating. Where would you like to see the school in 5 years? Still being quietly excellent. I really want it to be full of great teaching and happy people. Mrs Snowdon helped us make Christmas wreaths this week.